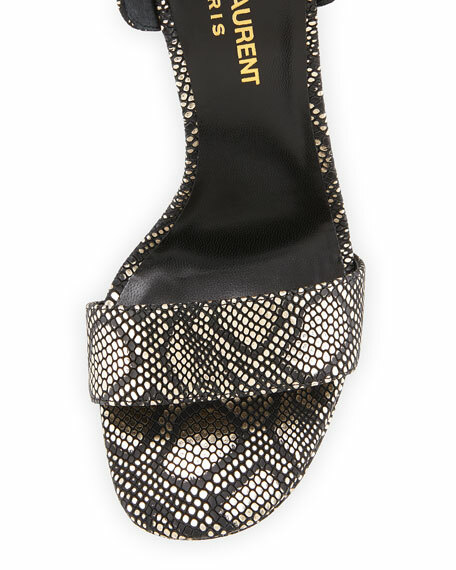 Saint Laurent python-print leather sandal. Wide strap bands open toe. Founded in 1961, Yves Saint Laurent was the first couture house to introduce the concept of luxury pret-a-porter in a 1966 collection called "Rive Gauche," synonymous with youth and freedom. This shift represented a first critical step in the modernization of fashion and revolutionized the socio-cultural landscape. In 1999, the luxury goods division of the PPR Group acquired Yves Saint Laurent and, under the creative direction of Hedi Slimane since March 2012, continues to position the house at the summit of the luxury universe. Today, Saint Laurent collections include women's and men's ready-to-wear, shoes, handbags, small leather goods, jewelry, scarves, ties, and eyewear. Parisian by birth and Los Angeleno by choice, Hedi Slimane is lauded not only for his work as a designer and photographerbut also for his past contributions during his tenure as menswear director for the house. For in-store inquiries, use sku #1512125.